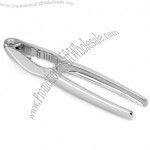 Spend less time cracking your lobster and more time enjoying it with this 6" chrome plated double jaw lobster cracker! 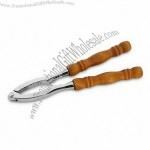 Breaking open shellfish can be difficult business, but thanks to this tool's rigid interior which holds the lobster still, you can crack open its outer shell without destroying the edible inner meat. This lobster cracker can double as a nutcracker in a pinch and comes with a display card. Custom-made Jaw Lobster Cracker From China Factory, Low price Jaw Lobster Cracker, Top Quality, True wholesale source for original!